A large thunderstorm cell developed over Southeastern Idaho late Wednesday morning (July 11, 2012) and drifted slowly east over Northwestern Wyoming at around noontime. This thunderstorm cell grew to roughly the size of Teton County,WY and produced a fair amount of lightning as it moved overhead. 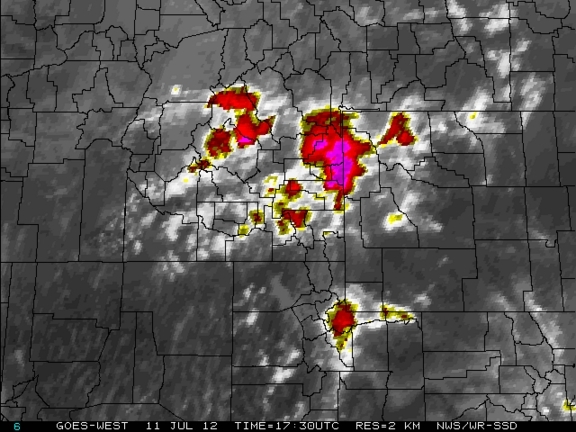 The images below are from the height of that thunderstorm as it was moving over Jackson Hole & the Tetons, with the heaviest concentration of lightning was across the southern part of Jackson Hole. One of those bolts that hit the top of Snow King managed to fry one of the components in the computer that runs the lightning detector, hopefully that will get repaired in the next day or so. 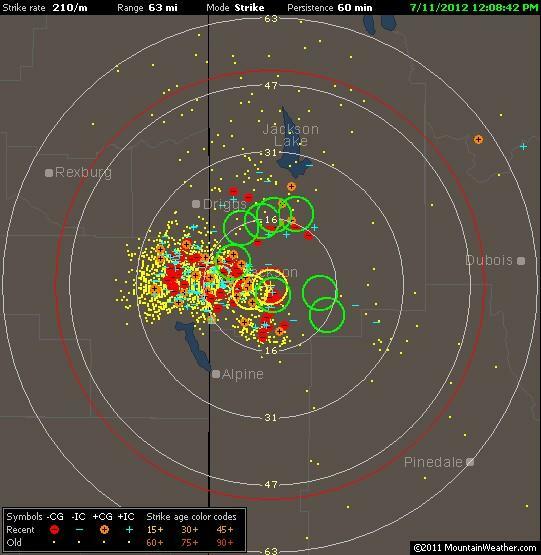 (You can access this via the Lightning Map Page on mountainweather.com). Lightning Image is a bit complicated to explain, but you get the idea, there was a fair amount of lightning. Red & orange dots are bolts hitting the ground, green & yellow rings are the instrument trying to discern parts of the thunderstorm that are producing the most lightning strikes. Instrument also can detect in-cloud lightning, depicted by blue plus/minus symbols. Radar image & Satellite photos also show the aerial extent of this thunderstorm very well. These images are all taken from very close to the noon hour. This was a slow moving thunderstorm, due to very light winds aloft, which contributed to its ability to produce a large amount of lightning over a concentrated area. Some gusty winds were produced in some places and there was a downpour of rain in other places, beneath this thunderstorm. Wind Gusts: In the valley winds gusted up to 31 mph at Timbered Island weather station in Grand Teton National Park. Unfortunately, the Town of Jackson instrument was down during this event, so no data was available from there. In the mountains at the Raymer wind station near 9500-ft. at the Jackson Hole Mountain Resort recorded a wind gust of 45 mph at around 12:15 pm. At the same time on the Lower Saddle of the Grand Teton at 11,600-ft. there was a wind gust of 52 mph. Rain: Phillips Bench Snotel had 0.10 inches of rain, the USFS instrument in Jackson had 0.11 inches. Areas north of Town in Teton Park and over in Driggs, ID only reported a trace of precipitation. The Raymer precip gauge at around 9300-ft. showed 0.08 inches. Keep in mind that anytime you hear “thunderstorms” in the forecast, that should imply the potential for gusty downdraft winds, and/or brief downpours of rain, and of course, lightning! Valuable info. Lucky me I discovered your website accidentally, and I am surprised why this twist of fate didn’t happened earlier! I bookmarked it.